A healthy sperm and a healthy egg! How many times have you considered having a baby and put it off to a later time thinking that this may not be the right time? Your reasons may be financial concerns, responsibilities, traveling and so on. But sometimes you just have to give it some time because you are not yet "fit" to have a baby. Being "fit" means to be in a state of physical and emotional well-being. Pregnancy should not be considered only a 9 month journey but it is a year long journey that helps you prepare your body for the changes of pregnancy. An unhealthy lifestyle coupled with certain risk factors like age, drug use and other medical problems can complicate pregnancy. If you have been leading an unhealthy lifestyle and do plan to have a baby soon, you don't need a better reason to make the change! Start right away because parenting begins long before your baby is conceived. • The healthy diet: Eating a healthy diet gives your child everything needed for a healthy start in life. Eating a balanced diet rich in fruits and vegetables, increasing the intake of foods with certain specific nutrients like folic acid, vitamin C and zinc can be beneficial to the mother. • Smoking: Quit smoking as soon as possible. Several studies have shown that women who smoke before as well as during pregnancy have an increased risk of miscarriages, premature birth, still birth and the chances for congenital problems in the child increases to a great extent. • Alcohol: It can reduce the chances of getting pregnant. Alcohol can have an effect on ovulation, cause ovulatory dysfunction and hormonal imbalances that can affect conception. In men, alcohol can affect the sperms and the cells that produce them. This again can have an impact on conception. • Medical issues: If you do have any medical issues like high blood pressure, diabetes or cardiovascular diseases, make sure they are under control with the appropriate treatments. Infertility issues in either of the partners also need to be looked into. • Exercise: Exercising can help you prepare your body for pregnancy. It improves your cardiovascular health, stamina and fitness level. It also helps to put your weight under check and hence, reduce the chances of diabetes and hypertension during pregnancy. Exercise also reduces stress levels and lightens up your mood. Involve yourself in at least 30 minutes of physical activity every day. • Caffeine: Cut on your caffeine intake as excess caffeine can lead to an increase in the estrogen levels which in turn can alter the normal ovulation cycle. Alteration in this cycle can lead to infertility issues. Cut down your caffeine intake to a minimum of not more than two cups every day. • Get off the pill: If you are on contraceptive pills on a regular basis, do stop taking them. They could alter your menstrual cycles and cause infertility problems. • Cut down on stress: A stressful lifestyle can trigger frequent headaches, depression, weight gain, and hormonal changes that can lead to infertility. Relaxation techniques like yoga, exercising and counseling can ease stress and put in you in a better state of mental health. • Work hazards: If your workspace does contain radiations or toxic substances, you may have to look for an alternative. These substances can lead to infertility. 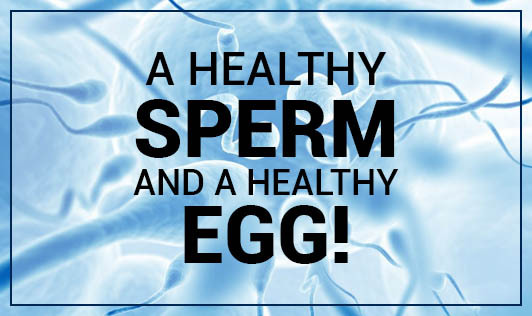 After all, every couple wants to start with a healthy egg and a healthy sperm! Do the best you can for your little bundle of joy!